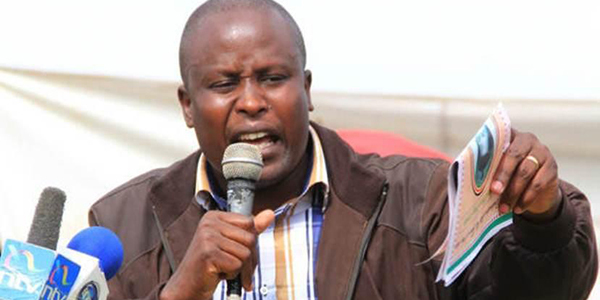 Kieni Member of parliament Kanini Kega has urged President Uhuru Kenyatta to sack any Cabinet Secretaries who are not performing to the expectation. The chairman of the Parliamentary Committee on Trade, Industry and Cooperatives also added that the National Assembly is ready to approve new names in the event that the current CSs no longer hold office. Kega called on any Cabinet Secretary not ready to follow President Kenyatta’s execute order on the role of CS Fred Matiang’i to step down. According to the legislator, the President is free to bring to the House names of new nominees as more than half of the current Cabinet Secretaries have not been working as is required according to the jubilee party manifesto. He further urged the president not to issue any further warnings to but instead reshuffle the Cabinet and send people home. The MP who was speaking to members of the Press in Nyeri town added that time to implement the Jubilee Agenda was running out and there is need to have a team that can deliver to avoid blame games in the future. It should be punishable by death for marriage btw Whites and blacks !